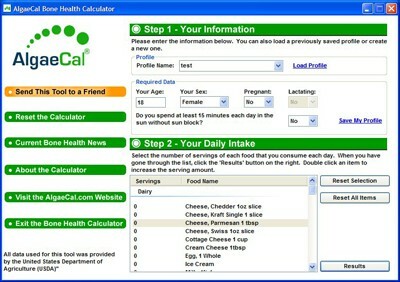 Calculate how much calcium, magnesium, vitamin K and vitamin D you are getting from your diet. 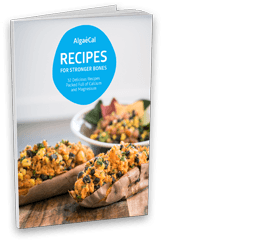 Download a new and improved version of our AlgaeCal Bone Health Calculator to your PC so you can keep track of your dietary intake of important bone building nutrients. A review of scientific literature has confirmed only a small handful of nutrients are proven bone health builders. These include Calcium, Vitamin D, Magnesium, Strontium, and Vitamin K. Using the carefully researched USDA nutrient database for these nutrients, you can assess your diet as a predictor of bone health with this tool. How do you use it? Just estimate yesterday’s food and click the “view summary” button to see if you are meeting the recommended amounts of these key bone health nutrients (minus strontium, since there is no good dietary data available). Use this unique calculator often to optimize your bone health, and that of your loved ones. Send to A Friend Feature, send a download link to all of your friends so they can have this great tool too! *Sorry but only available for Microsoft Windows XP and above. Step 1 – Enter your name and the required data and then click on “save profile”. This will save all of the required data so next time you open the calculator you can just select your profile from the drop down menu and click “load profile”. Saving your profile will also give you an average of your results to see how well you are eating over a longer period of time. Summary – Review your USDA recommended daily intake levels compared to your actual daily intake levels from your diet. At the bottom of the screen you will see your recommended changes for your diet. Profile History – If you have used the calculator before and you saved a profile, you can click on “Profile History” to see an average of your results from the past. If you are not meeting your recommended daily intake levels of calcium and magnesium you can try these great recipes from our Bone Health Recipes Ebook or you can supplement the shortfall. It is always best to obtain these nutrients from food, but if you can’t achieve this with your diet then AlgaeCal is the next best thing. AlgaeCal is a whole food calcium and magnesium supplement. If you are not meeting your recommended daily intake of vitamin D, try to spend at least 15 minutes in the sun each day without sun block, or you can supplement. AlgaeCal Plus contains 1600 IU of Vitamin D3 in a daily dosage. If you are not meeting your recommended daily intake of vitamin K you can try to eat a little more than 1/2 cup of chopped broccoli (the best source of vitamin K) or a large salad of mixed greens every day. Recent research has shown that vitamin K2 is the most effective form of vitamin K. To obtain vitamin K2 you can try Natto, a typical breakfast food that is made from steamed and fermented soy beans or you can supplement. AlgaeCal Plus contains 100 MCG of vitamin K2 as MK-7 in a daily serving.